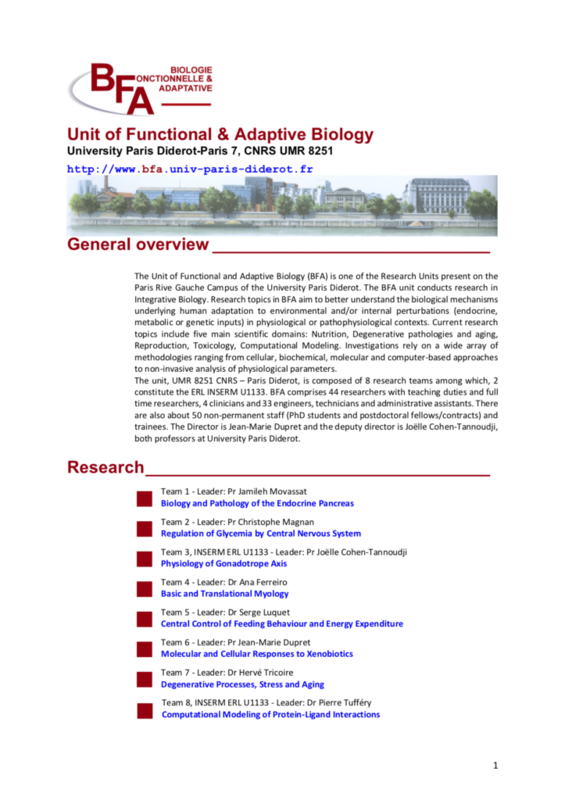 The Unit of Functional and Adaptive Biology (BFA) is one of the Research Units present on the Paris Rive Gauche Campus of the University Paris Diderot. The BFA unit conducts research in Integrative Biology. Research topics in BFA aim to better understand the biological mechanisms underlying human adaptation to environmental and/or internal perturbations (endocrine, metabolic or genetic inputs) in physiological or pathophysiological contexts. Current research topics include five main scientific domains: Nutrition, Degenerative pathologies and aging, Reproduction, Toxicology, Computational Modeling. Investigations rely on a wide array of methodologies ranging from cellular, biochemical, molecular and computer-based approaches to non-invasive analysis of physiological parameters. The unit, UMR 8251 CNRS – Paris Diderot, is composed of 8 research teams among which, 2 constitute the ERL INSERM U1133. BFA comprises 44 researchers with teaching duties and full time researchers, 4 clinicians and 33 engineers, technicians and administrative assistants. There are also about 50 non-permanent staff (PhD students and postdoctoral fellows/contracts) and trainees. The Director is Jean-Marie Dupret and the deputy director is Joëlle Cohen-Tannoudji, both professors at University Paris Diderot.